War has finally arrived along with the demons who are planning to take the world back from the humans and other species who have ruled for hundreds of years. Rummon, lord of the dragons, must be resurrected to end the war. But doing this will cause a second war, a war pitting dragons against dragons. This war of dragons, giants, demons, and altered creatures must be stopped before all is lost. It will be up to Thorik and his companions to figure out how to restore peace, assu.. The Oracle's prophecy states that the sons of the Brothers of War will fight to the death. One of these sons has trained his entire life for this day. Learning to manipulate the powers of light and darkness, he lays devastation to all life in his path. He is ready for the Eve of Light and the end to the curse upon them. The other son, Ericc, was hidden away from society and the prophecy in hopes to keep him safe. However, his tenacity for adventuring beyond the restric.. The winter had begun. At Gunnaring Gap, the valiant Riders of Valon began their charge. And though Challerain Keep lay in ruins and butchery had led to the capture of Princess Laurelin, heroes strode forth from the ranks of Men, Elves, Warrows and Dwarves to turn the tide of doom. And across the land ruled by unnatural dark, freedom flickered and burst into flame... DOWNL..
Kati thought she was Tumatsin, but her real father was Moshuguang, a Searcher, one of those working to bring down the feudal empire on Shanji and establish a progressive society. Ruled by Mandughai, the emerald-eyed empress of a neighboring star, the Searchers are looking for the person who has inherited the power to be a super being. They believe Kati is that person, and with training from Mandughai, Kati's powers exceed her trainer's power. To bring unity to Shanji .. It has taken some adjustment, but Nita Graus has made quite a home for herself among the crew of the Wind Breaker. Under her skillful care it has become one of the only airships to stay aloft without the continuous repair and oversight of the vile and manipulative fug folk. Word of her adventures with Captain Mack, Gunner, Lil, Cooper, and Wink has made the whole crew into living legends among the residents of the mountain towns of Rim, but in doing so it has also made findin.. Troubles and delays continue to mount as King Garion, Belgarath, Polgara, and the company pursues Zandramas across the known world. Possessed by the Dark Destiny, Zandramas has kidnapped Garion's infant son and plans to use him in a ritual that would destroy all that men value. Always one step ahead, taunting and spying on Garion and his party in the form of a great flying dragon, Zandramas races to beat them to the "Place Which Is No More." Desperate to arri.. In a small town in Colorado, Markus Spiros was just getting his life on track. By day he worked as a veterinary tech, by night he took classes. His steady little routine was rolling along nicely when his impulsive Uncle Dimitrios threw a wrench in the works. Thanks to an unannounced trip, Markus had to swing by his uncle’s bistro to tend to the ‘special oven.’ When he arrived, he discovered it wasn’t the oven that was special, it was the rare and exoti..
“FROM ALL DIRECTIONS, IN THE DARKNESS, A GREAT TERROR APPROACHES THIS WORLD.” THE OLD WIZARD LOOKED AT ME FOR A MOMENT, REFLECTED STARLIGHT BLAZING IN HIS EYES. “I MEAN TO FIGHT THE TERROR, AND I WOULD MAKE A WEAPON OF YOU.” Daven Carrickson grew up as a beggar in the filthy alleys beneath the shadows of the palace. He's the son of a known thief, disgraced and despised. His only real talent is his ability with a sword, and his only real chance a..
Trevor “Lex” Alexander’s life has been less than blessed. In the past year he’s had to battle corrupt corporations, deranged techno-terrorists, and a robotic scourge. Now he’s received the opportunity to finally return to the racing career that had been cut short by some poor decisions. One could excuse him for not wanting to be embroiled in another insane adventure when he is so close to returning to his life’s calling. Sometimes the call .. The Sky is Falling! The Sky is Falling! No, wait! It’s just Landon Snow and his sisters– Holly and Bridget–who have hurtled through a trapdoor, and are now freefalling from the sky into the magical world of Wonderwood. But will they be too late to save their friends? The scene looks mighty grim as the evil Arcan army joins forces with the fiery dragon Volucer Ignis. Can a little girl lead a nationsafely through a forest of frozen soldiers leaking shadowy dem.. Mother's Day, and every day in between! Eight thousand hunters descend on Crawford County, Texas, for the annual pheasant season. To Sheriff Charles Matthews that's eight thousand chances for a gun-related accident. But when the most hated man in the county, banker Rich Hansford, turns up with his face removed by a shotgun blast, it's no accident; it's murder. To Crawford County folk, it's a public service killing, and no one, not even the sheriff's staff, are much interested in seeing anyone arrested. Certainly no one will inform on his neighbor; in fact, no one will talk at all. 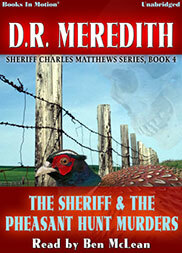 It's up to the sheriff to break through the wall of silence and arrest the murderer. Rebecca Fletcher grew up on the genteel plantation of Live Oaks, her father's family home on the James River in Virginia. After her father was killed in Vietnam, her grandmother, Minnie, assumed the role of both mother and father to Rebecca. Rebecca's mother, Nina, was never talked about. But after Minnie's death, Rebecca's Uncle William decided to subdivide Live Oaks. Now, to save Live Oaks, Rebecca must find Nina alive. 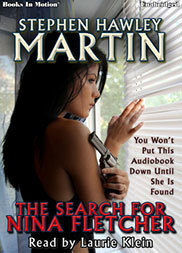 The search pulls Rebecca into a nightmare of underworld intrigue and a generations old Corsican feud.